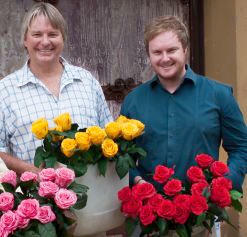 African Floralush, which trades as Iluba, is headed up by South African entrepreneur JJ Viljoen and his son, Fanie. The flower head and stem are preserved separately. Once preserved, trained staff carefully join the two parts again, using stitching and glue. Iluba is creating both direct and downstream employment opportunities for South Africans. 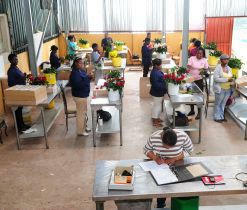 African Floralush buys roses from contract growers at a certain size and stage of development. Most of their customers prefer traditional colours, but some market segments enjoy enhanced bloom colours. Iluba flowers are treated with natural dyes to reinforce their colour and ensure that they remain crisp and beautiful for months. Innovative technology to preserve and extend the shelf life of fresh flowers, developed by the Nelson Mandela Metropolitan University (NMMU), is helping to boost job creation, develop skills and establish new market opportunities for South Africa’s flower industry. People have tried for centuries to preserve the beauty of flowers, but now local research at the NMMU’s Institute for Chemical Technology, InnoVenton, has perfected a technique that makes it possible to produce a natural alternative to artificial flowers. A Gauteng-based company, African Floralush, which trades as Iluba, is using the patented treatment process to preserve fresh roses and foliage. The company is headed up by South African entrepreneur JJ Viljoen and his son, Fanie. The company’s Iluba roses are fast gaining local and international popularity, and show how academic research combined with business acumen can make a positive impact on society. The university is a shareholder in both the patent-holding company and in the manufacturing company, African Floralush, which licenses the technology. The Industrial Development Corporation (IDC) provided the bulk of the investment to start the business. Viljoen says it was a rose grower from Addo in the Eastern Cape, Tinie Maske, who first approached the university with her idea to preserve roses. She experimented with various preservation methods in her kitchen at home, and believed that she was onto something with great promise. The NMMU took the idea, conducted further research, development and extensive testing, to develop the technique which is used today. Maske, InnoVenton’s director Professor Ben Zeelie, and Dr Shawn Gouws also of InnoVenton, can be credited as the inventors of the long-lasting rose. Viljoen says one of the biggest challenges of the new business was to refine the laboratory-scale technology to be suitable for processing at an industrial capacity. Jaci Barnett, director of the NMMU’s technology transfer office, explains that this is not unusual if new technology is commercialised. The business has been in operation for just over three years, but through trial and error and hard work their efforts are paying off. The long-lasting roses are now distributed throughout 30 countries including Australia, Japan, Saudi Arabia, the US and Canada, European countries and South Africa for use in the gifting and décor market. Sales of the roses are mostly to wholesalers for onward distribution in retail stores and directly to the hospitality industry. Unlike freshly-cut arrangements, Iluba roses don’t have to be replaced and this is why the product is popular with home decorators, hotels, ocean liners and long-distance train operators. Research and development is underway to determine if the same techniques could be applied to preserve proteas and other varieties of flowers. As no cold chain is required, the company can also help to estab­lish emerging growers in rural areas to participate in the Iluba supply chain. 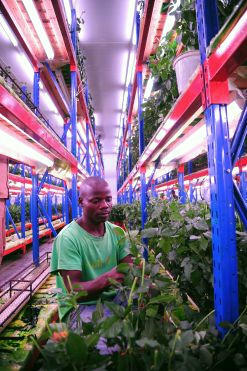 Iluba is creating both direct and downstream employment opportunities for South Africans. The business employs 90 workers, most of whom were previously unskilled, and Viljoen says they expect to employ a total of 120 people next year. More than 30 new and independent business enterprises were established in 2011 alone as a result of Iluba’s activities. They include enterprises that use the products to create new value-added décor and gifting floral products, as well as new specialist retail and distributor outlets. Creating a single long-life rose is a highly technical process as workers have only a few hours, while the roses are absolutely fresh, within which to complete the preservation process. 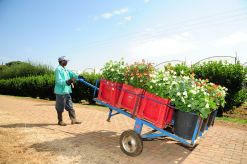 African Floralush buys roses from contract growers at a certain size and stage of development. The first step is to remove the flower head from the stem, as each part is preserved separately. Once preserved, trained staff carefully join the two parts again, using stitching and glue. Dr Shawn Gouws of InnoVenton explains that the water in the cells and tissues of the flowers and foliage are replaced with natural eco-friendly preservatives. This allows the flowers and foliage to last for six months without water. Viljoen adds that the chemicals and preservatives are similar to those commonly used in the commercial manufacture of cosmetics and processed food. The technique makes it possible to add natural perfumes to strengthen the fragrance of the roses, and the colours can also be adjusted. Fanie Viljoen says although 80% of their customers prefer traditional colours, some market segments enjoy enhanced bloom colours, including deep brown, black, blue and purple. The natural pigment in fresh cut flowers fades and becomes brown with time, but Iluba flowers are treated with natural dyes to reinforce their colour and ensure that they remain crisp and beautiful for months. Iluba flowers also have a very low carbon footprint, as they do not need refrigeration and can be shipped as opposed to air freighted, offering major environmental benefits. According to JJ Viljoen there is a growing market for long-life flowers, particularly as the cost of replacing fresh flowers has become so expensive. As a result of the tough economic climate, consumers are spending less on luxury items such as flowers, which has caused the fresh cut flower market to decline locally and globally in recent years. 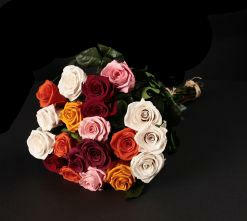 However, in South Africa alone, the import of artificial flowers has grown by an average of 38% per year. He says market research has shown that despite the move away from fresh cut flowers and more consumer interest in artificial flowers, the market would still prefer natural flowers, if they offered a much longer vase life. African Floralush has also won a few awards for its unique product and business concept. Recently the company was named the winner in the small business category for innovation in the 2012 IDC Business Partner Awards. The awards celebrate IDC-funded businesses that have contributed to commercially sustainable industrial development in job creation, innovation and sustainability.